This band of trimming would have been suitable for upholstery but was actually made specifically to demonstrate the brilliance of the embroidery machine. The machine that created this embroidery was worked by three, four or five girls, depending on the complication of the design. The needles were threaded with 42 inch lengths of silk to ensure no wastage of silk. Shaded (or ombré) effects were obtained by dyeing the silks with graded colour. The benefits of the machine over hand embroidery were the speed, accuracy, and excellence of the work, particularly for repeating patterns. 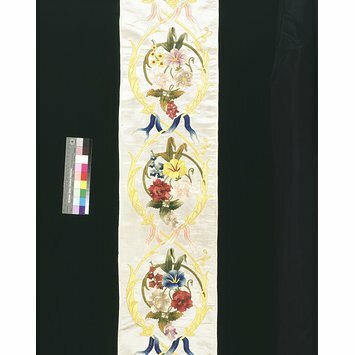 The two sides of the embroidery was also identical, making it suitable for window curtains, table covers and trimmings for upholstery and dress. In 1829 Henry Houldsworth, a Manchester silk spinner, purchased his first industrial embroidery machine, together with British patent rights, from Mulhouse in France, where it had been invented a year earlier. By 1834 improvements had been achieved by Houldsworth and Louis Schwabe, a fellow manufacturer. Schwabe's first successful use of the machines concentrated on costume embroidery, especially men's waistcoats. On Schwabe's death in 1845 Houldsworth took over his business. From this time it was known as James Houldsworth & Co. and became the leading manufacturer of machine embroidery in Britain. Houldsworth exhibited his work at the Manchester Exhibition of 1848, the Great Exhibition of 1851 and the Dublin Exhibition of 1853, from where this example was purchased. The London Gazette of 28 July 1868 records that the partnership of James Houldsworth & Co was dissolved on 4 July 1868 'by mutual consent' on the retirement of James Houldsworth and another partner. The firm was then known as Cowlishaw, Nicol & Co in England and Nicol, Cowlishaw & Co in America. The relevant partners were Robert Nicol [1831-1879]and William George Cowlishaw. According to the London Gazette Robert Nicol retired in 1878, and the firm went into receivership on 29 August 1888. 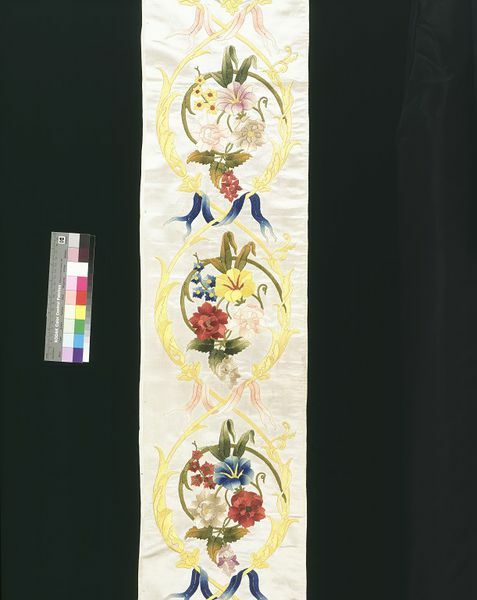 Machine-embroidered silk trimming on a white silk-satin ground. Decorated with stems and flowers.